A turquoise, red and purple metal sunflower ushers the viewer into the exhibit, “Dee Marcellus Cole and Carnival Seekers,” at the Claremont Museum of Art. The lobby featured the first selection of pieces against makeshift corner walls reminiscent of Dee Marcellus Cole’s colorful house. Paper cutout flags lined the ceiling. Upland based faux-folk artist Dee Marcellus Cole, who was an art instructor at La Verne for 12 years, showcased seven other folk artists whose pieces she knew would correspond alongside hers: Johnnie Dominguez, Cathy Garcia, Sandy Garcia, John Neiuber, Karen Neiuber, Christian “Neighbor Kid” Ornelas and Dan Romero. Folk artists are not academically trained in art. Cole considers herself a faux-folk artist since she did go to school for art, but feels her work connects most with local artists whose creativity come from pure passion and not techniques they learned in a class. Catherine McIntosh, board member at the Museum, said that the carnival theme was chosen to coincide with “Pacific Standard Time: LA/LA,” an exploration of Latin American and Latino art in dialogue with Los Angeles, and was an ideal hot weather, summertime exhibit. Much of Cole’s work is inspired by her love of carnival celebrations that she experienced during travels in Bolivia and Guatemala among other South and Central American countries. Carnival celebrations. “In their artwork they’re seeking ways to express the flavor of traditions they love even though they may not have a cultural connection or been to the places,” McIntosh said. Most of the vibrant pieces resembled figures from Latin American culture like Mexican sugar skulls. The mosaic “Senorita with the yellow flower,” by Cathy Garcia depicted simplicity as the sculpture was exactly what the title describes, while her piece “Hurts so Good,” seemed to be a woman with chili peppers spilling out of her head, but may have been carrying them from harvest. McIntosh said her mother, Marguerite McIntosh, founded the CMA in 1987 in the Padua Hills Theater. Catherine and Marguerite are daughter and wife to the late, famous ceramicist Harrison McIntosh. When the theater began restoration, the board set their eyes on another historical building. In 2007, the museum reopened in the College Heights Lemon Packing House but closed in late 2009 due to the 2008 recession. The new location at the Claremont Depot has been open since Nov. 20, 2016. However, the museum grew more in its interim years than when they had their first permanent location. McIntosh said that CMA put on two exhibits per year at other locations. She added that she created the Padua Hills Art Fiesta which is held yearly at the Padua Hills Theater to celebrate local folk artists. The museum also developed an education program called Project ArtstART that brings quality training and mentoring in art at schools that have insufficient art programs. The Art Fiesta is meant to bring back the feeling of the “golden age of Claremont artists,” the 1950s, McIntosh said. Everything is still done traditionally as the festival was from 1953 to 1959. The 10th annual Padua Hills Art Festival will be from 11 a.m. to 4 p.m. Nov. 5. Some pieces are shamelessly controversial such as Dan Romero’s “La Bandera,” which depicts the center of the Mexican flag- an eagle on a cactus holding a rattlesnake- and also symbolizes the hard-working Mexican immigrant, according to Romero, using different rusty metal objects like a wrench and a rake. Volunteer exhibit assistant Duc Hong said that she studied fashion and art at the Art Institute in Chicago before moving to California in 1986 and wants to reconnect with the art community. “What a community it is in Claremont,” she said. “There are so many well-known artists. Hong said that since the exhibit has been up for a couple months, she gets the opportunity to study the pieces now that there is less foot traffic in the museum. “I thought it was funny that the ‘Blue Bull’ is made of glass. It made me think of ‘a bull in a china store’,” Hong said. The mosaic bull is comprised of mugs and other ceramic items in different shades of blue. 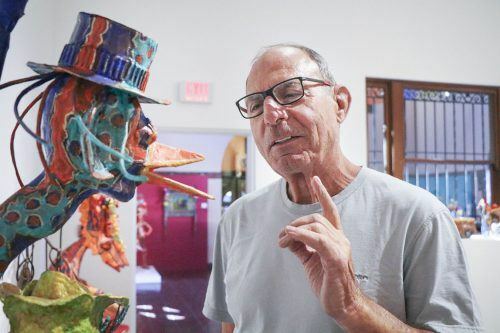 Al Marino of Duarte, 75, compared the frankness of abstract art to personal wisdom. “Age comes with clarity,” Marino said. “It’s not our mission to impose that on anyone else.” Marino said the abstract artist intends to convey a certain message, but should expect every viewer to receive a message of their own. The exhibit is on display until Nov. 26. In an earlier version of this story, the date for the Padua Hills Art Festival was incorrectly given as Nov. 3. The festival will actually be on Nov. 5. The Campus Times regrets the error.